The Control-Flow is a fob-operated water boiler with an advanced programmable locking system, ensuring protection in environments where health and safety is of the utmost importance. With 4 different dispense functions, staff and patients alike can enjoy hot beverages without fear of scalding themselves in the process: None/Open: No lock. Users can push and hold the button to pour boiling water. Toggle: The fob turns the dispense function on and off sequentially, as and when required. Timed: Water is dispensed for a pre-set time, before automatically locking. One-shot: A single drink is dispensed before the boiling water function turns off. What Makes The Control-Flow A Great Addition To Your Clinic? One common grievance of mental health patients is the feeling of mistrust and discrimination when it comes to performing simple tasks such as making themselves a hot drink, or having access to water above 80°C. The Control-Flow aims to reduce the number of outbursts, machine damage and injury to support staff and patients that can occur because of this, by allowing them to safely, easily and efficiently pour themselves a tasty tea or coffee. 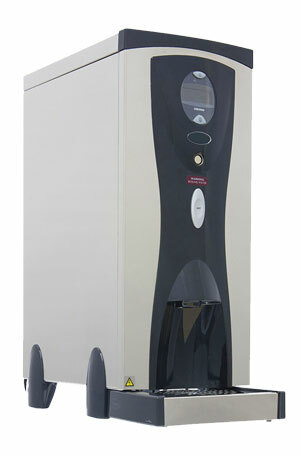 • A fob-operated water boiler minimising the risk of scalding, injury and upset. • Boiling water is available on demand to make hot beverages. • Tank-baffle plates aid heat recovery and reduces the amount of steam emitted into the atmosphere. • Dual safety protection: The boiler will cut out if it produces excess steam (over-boil) or has been boiled dry (boil dry). • Eco Mode saves energy by operating at half the capacity’s volume. • An easy-to-read LCD screen on the front of the machine, that tells users, ‘’Very Hot Water!’’ when dispensing and warns them about simple and critical issues, such as ‘CHECK WATER’, ‘OVERFILL’ and ‘CLEAN PROCESS’. Product Dimensions: (W x D x H) mm 260 x 465 x 608 (depth includes drip-tray). Product Weight: 14.2kg when empty. Product Weight: 28.5kg when full. Tank Construction: 304 & 316 grade stainless steel. Drip-tray: 304 grade stainless steel, with a mirror polish. Water Temperature: 96°c (can be adjusted down to 80°c). Heat Up Time: 32 minutes for a full tank. Output Per Hour: 28 litres/168 cups. Rapid Draw-Off: 12 litres/90 cups. "As safety is our chief concern, we’re always on the look-out for superior machinery that will keep even our most volatile of patients protected. We are really impressed with the Control-Flow, allowing us to ‘reward’ patients with fobs as a sign of trust in their capabilities, therefore letting them enjoy a hot drink whenever they want one. Some of our staff have noted how much safer they feel as a result and appreciate how simple the machine is to use. Regarding Choice Refreshments themselves, they were only too happy to help with any queries we had, ensuring the smooth running of our machines. I can’t recommend the Control-Flow and Choice Refreshments enough." Could the Control-Flow be the right machine for your clinic? Please call us today on 0845 3711 101 for more information or fill in our contact form and a member of our team will be in touch shortly.